Hi there crafty peeps! I am back today to share a quick and simple card I created using this month's Simon Says Stamp card kit and ribbon from this month's Red and Turquoise ribbon collection. 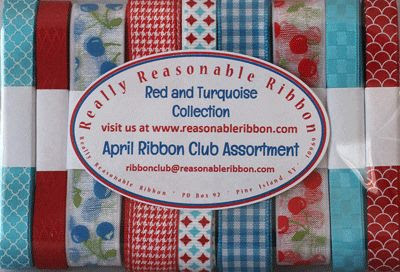 The ribbon collection can be found at the Really Reasonable Ribbon Store. I layered two strips of the included patterned paper onto a white card base. I then stamped and fussy cute three flowers and coordinating leaves from the stamp set. I layered them onto the front of the card in a bunch. I then stamped the sentiment on a scrap of white cardstock and cut it out with a border. I popped it up with foam tape to the top of the card base. I then wrapped 3/8" Diamond Red Satin ribbon around the card base and tied it into a simple knot. I added Journey Glaze to the sentiment and centers of my flowers to add dimension to the card. I hope you enjoy this simple but sweet birthday card. Have a wonderful day! Very pretty card Amber. Love the layers, and flower stamps.